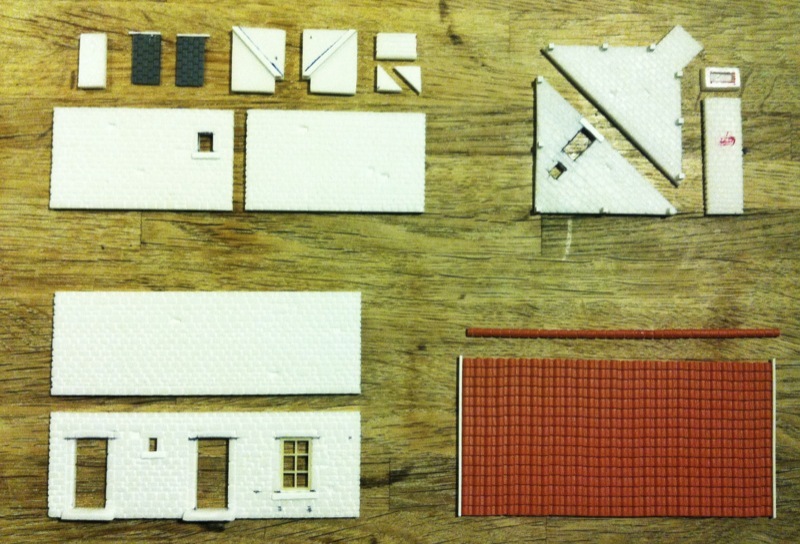 I have wanted to build my own houses for a couple of years now. 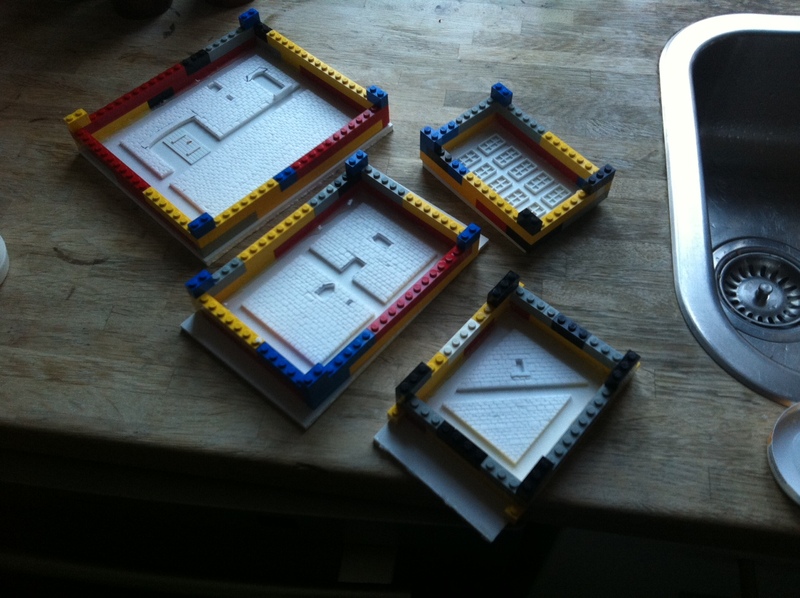 I started out building them in balsa and tried using liquid rubber for making moulds. The mix wasn’t very succesful as the rubber stuck to the smaller details of my wall pieces. I guess I could have sealed the surface better before pouring the rubber over the wall pieces, but still I decided to start all over with new materials, balsa wasn’t the easiest material to work with. Later my life took on a new direction getting a family and was out of the hobby for some years. Not long ago I saw the work of Emmanuel Nouaillier and remembered my old project. Full of inspiration from Emmanuel’s splendid work I took it all up again. Now I use other materials, mainly foamboard, the moulds will be made of silicone. 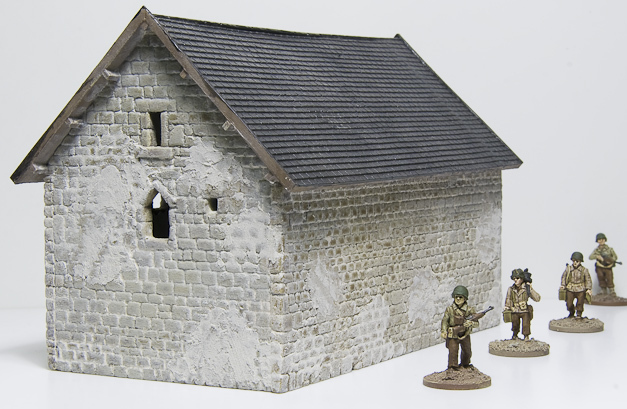 I will make several facades in different sizes and designs so that I can mix them to get a great variety of houses all in the typical Normandy style. 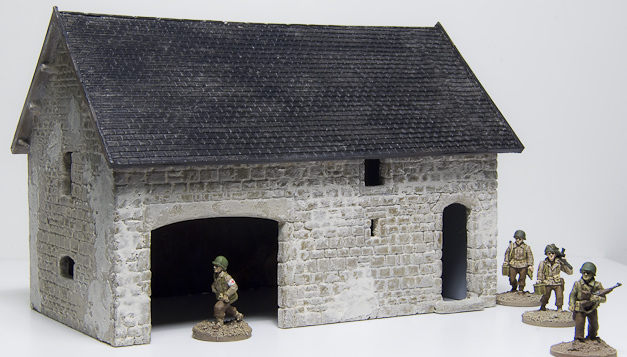 To make a good start I have chosen existing houses to be models for my farm houses – the houses in the area surrounding the bridge at La Fiére Manor. This bridge was fought for during several days in the start of the Normandy invasion. The houses will include a big Manor-like house, a chapel, a couple of farm houses plus lots of barn buildings, some stone walls and of course the bridge itself. Finding pictures of how the houses looks today, has been quite easy, especially using Google Maps “Street view”, but still have taken me many hours. 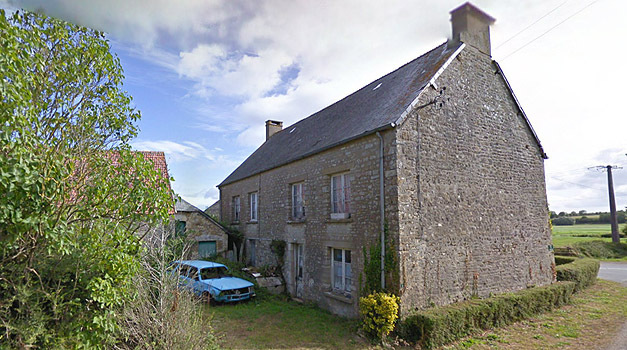 The problem is that many of the houses was damaged during the battle and when rebuilt some of them was altered, so making them true to the appearance of 1944 has not been possible for all houses, only for the houses where I have been able to find older pictures. I will change the dimension of some of the buildings to make them fit my “system” (explained further down). 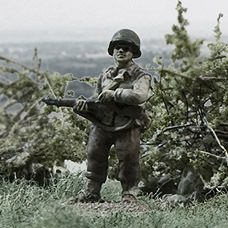 This little piece of land was the scene for some of the hardest fighting during the first days of the Normandy Campaign. The bridge that was important for both the German and the allied armies was in the center of all this. 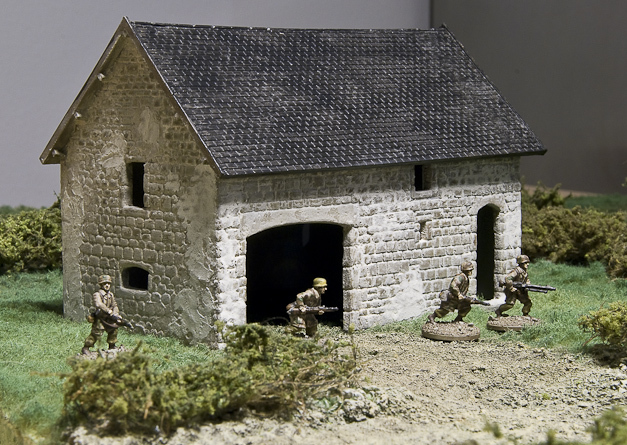 The americans needed it to breach out of the beach-head, and the germans to be able to counterstrike the allied forces on the beaches – this lead to several days vicious fightings. 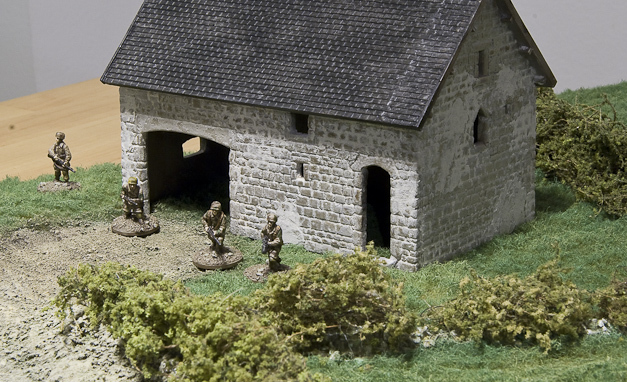 In a fairly flat land the old stone houses became important objectives to defend against the attacks that kept coming. 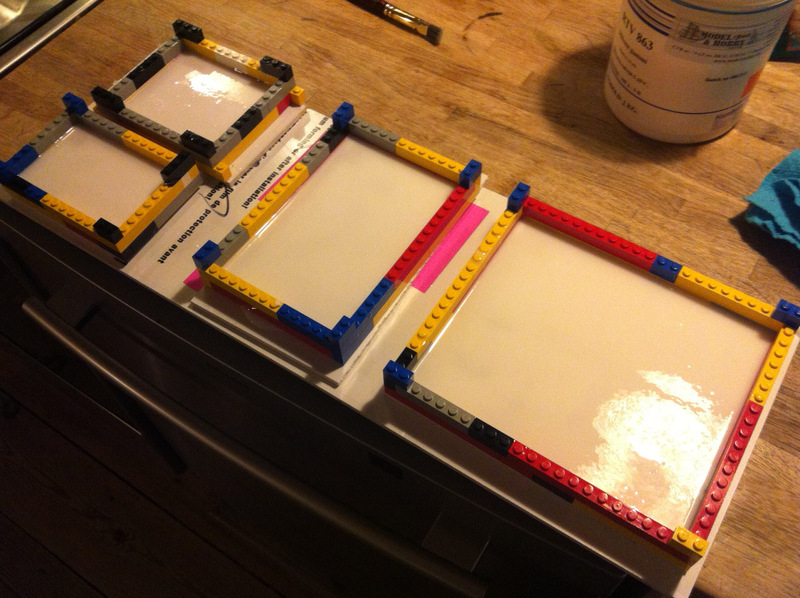 The white rectangle is “old” indications of the boards I planned to build to be able to play the missions (every rectangle was going to be 120mm x 60mm). Later I have found that the game board has to be bigger for several reasons. Shortening the causeway and the flooded fields is still a must, the length was 500 meters which would be 7 metres in 1/72-scale. 1. 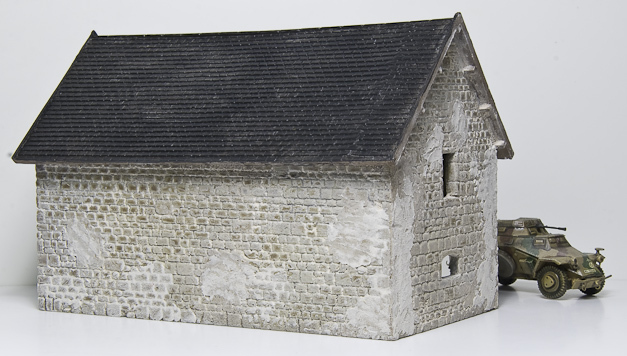 Main building of the farm called La Fière Manoir, a cool detail is the round tower on the backside of the building. 2. Small building that is built up against a stone wall on the back of the farm. The use for this house is unknown. 3. 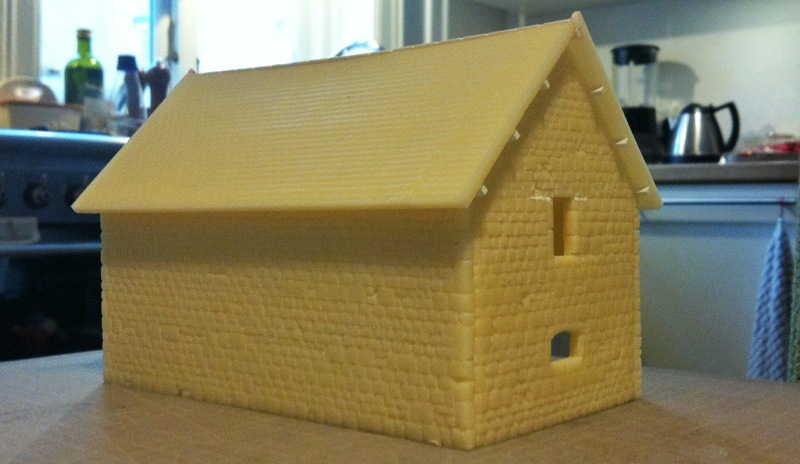 A small house in the end of the long, big barn building. 4. 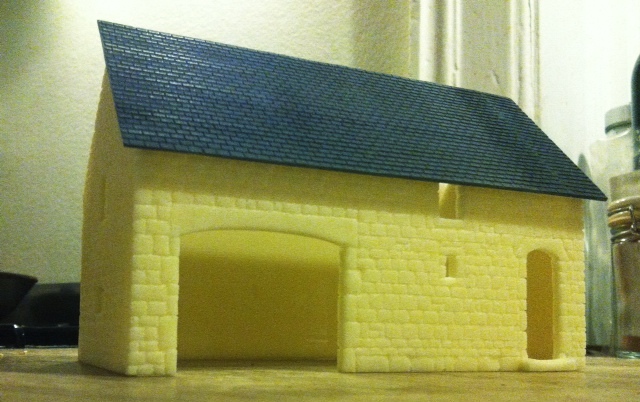 Extremely long barn building. 5. A small house that I guess has been the residence for workers on the farm. 7. 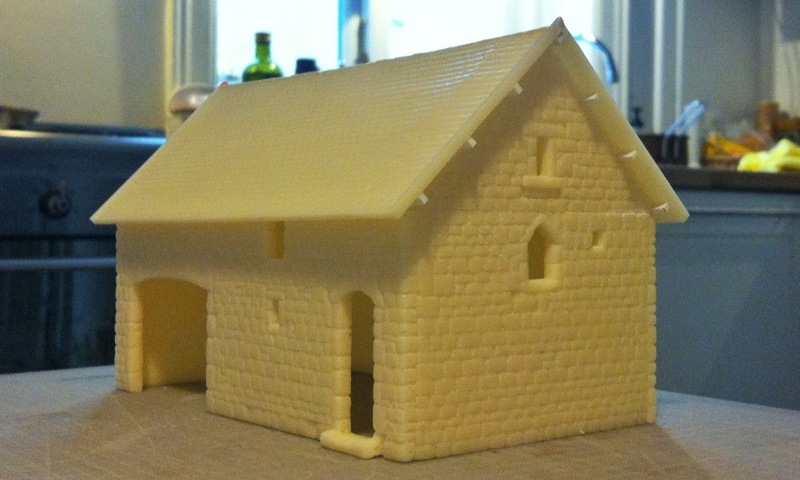 Yet another barn building. 8. This house I don’t know what has been used for, or if it belonged to the farm or not. I do have pictures showing that windows and door openings was a bit different from today. 9. A small building on the other side of the road, probably used for animals or tools. 11. 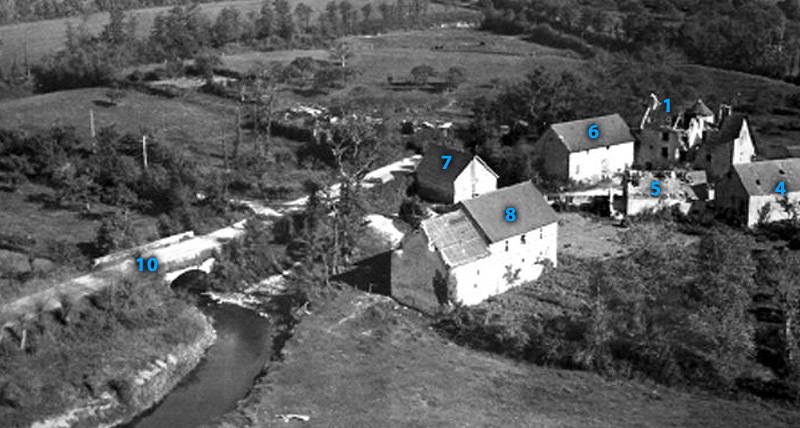 The first house in the small village, called Cauquigny, when coming from the bridge. 12. 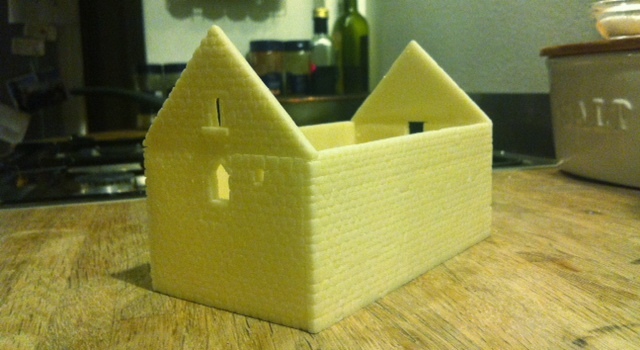 Barn building belonging to house nr. 11. 13. A small chapel with belonging graveyard and a special stone wall surrounding it. Some of the first fightings was in and around this building as US paratroopers, that was dropped on the “wrong” side of the bridge, took up a defensive battle here*. At this moment the bridge was still in the hands of the germans. X. 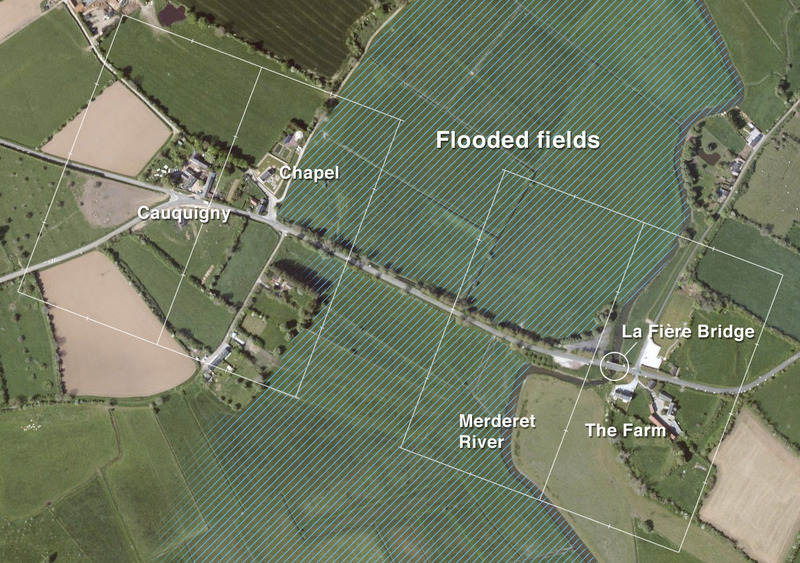 Not visible on any of this pictures is a couple of extra farm houses. 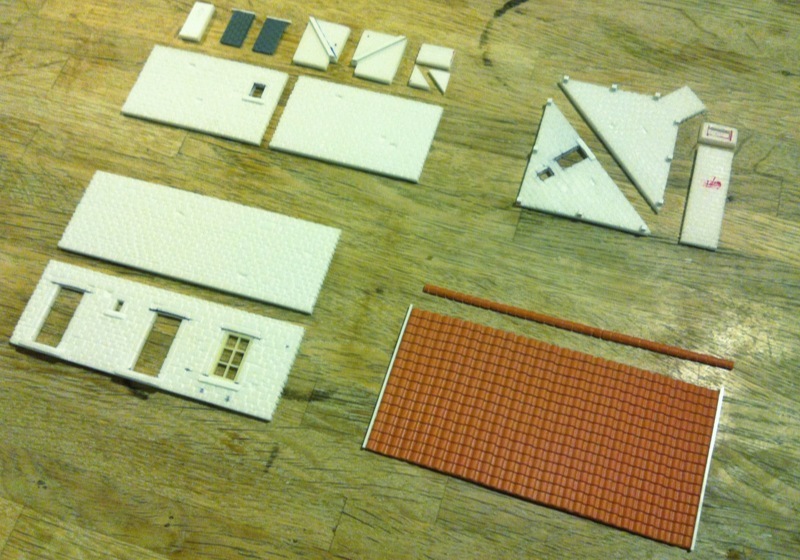 This buildings will all be made out of pieces made for all the other houses. A newer picture of the manor. The manor shortly after the battle. Several of the houses has been damaged especially the main building. The bend in the road to the left was where the americans put up a 57mm AT gun, the only weapon along with two bazookas that they had to defend against the german tanks. 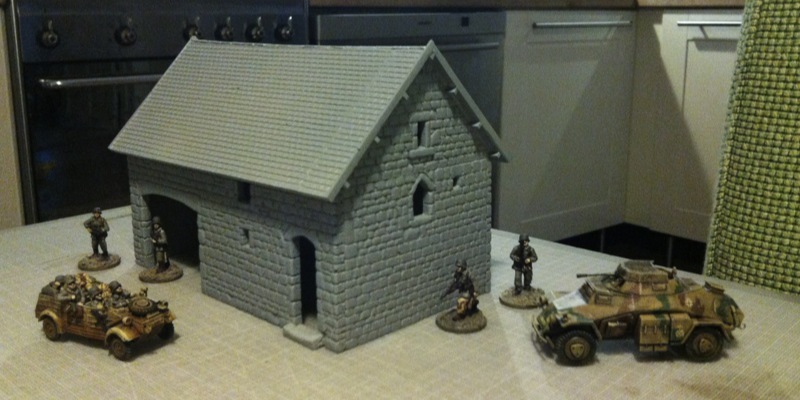 This pics really show how cool the main building is, built on a small rise and with the old tower on the back will make this a beautiful piece on the game board. Cauquigny, the little village from where the Germans launched their attacks on the bridge and from where they made the americans bleed when they attacked the village from the causeway. This building is extremely long. I have made it shorter, but still it is a very long building for a game board. The big opening has also been made smaller, a little bit sad but otherwise the building would be too big. The two side pieces in the top of the pictures will be used in both ends of the building which is one of the reasons to why I will make moulds of every wall piece. 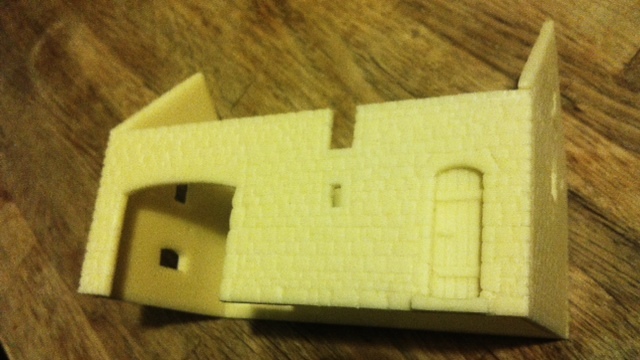 A few details including doors, chimney and roof still needs to be done. I have ordered some tiled plastic sheets from Wills that I will use for roof. 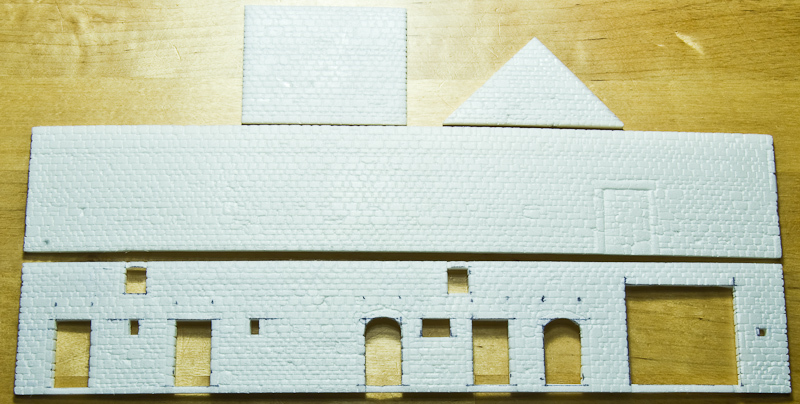 The small house don’t have the doors or windows done yet, but I also still have to do both the roof dormers and the roof itself. This is how the barn looks today, more or less the same as then. Several parts missing on this. From the start, when the project was less ambitious I was going to use the same pieces for the front and back, but has later decided against it. Doors, roof, windows, chimneyparts and of course the new pieces for the back of the house still missing. 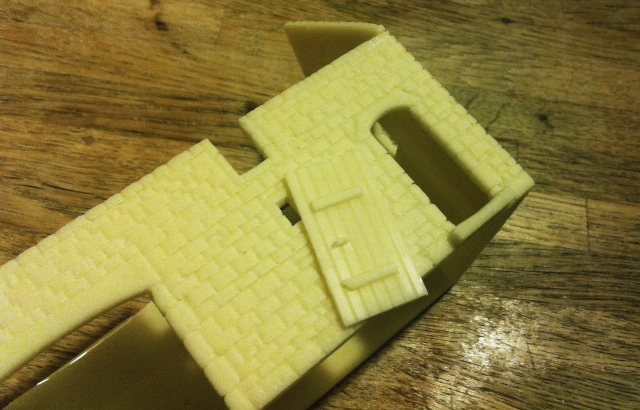 The lower piece on the left of the picture will be re-used on the other side of the house towards the garage plus several other places and I will probably make an extra mould for this because it will also be re-used a lot on other buildings. This is how the building looked like after the battle. When the americans launched their attack the causeway was covered by machine-gun fire from this building. The house have been altered a bit since then – today it has more windows on the front of the house. 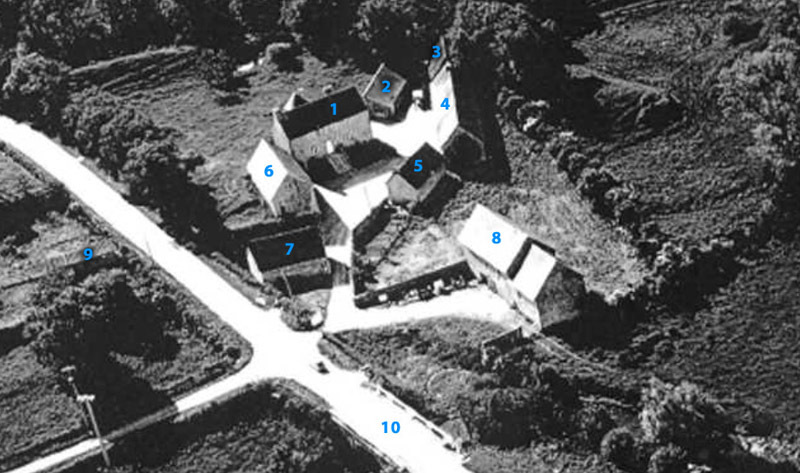 This is the only picture I have seen showing that the design of the chapel has been changed since the battle – newer pictures show the house with a big white arc up at the roof. The barn building belonging to house 10. Few details plus the roofs missing. The two steps up to the door is some I added without knowing if there are any in real life. How it looks today, there is not much indicating that it has been changed since the battle, but I am not sure on this. In the background the Chapel (house 13) is visible. I am making windows that I will mould and re-produce so that they can be added to my wall pieces – in this picture only one is ready. That’s all for now. 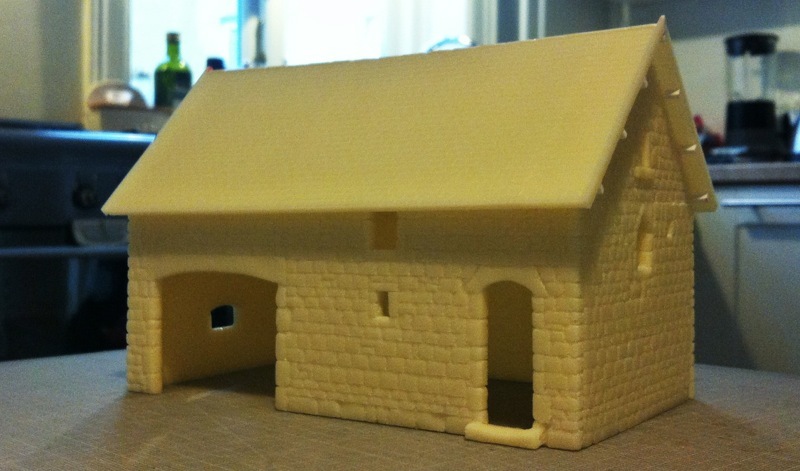 In a short time, when pieces for the first building is finished, I will start making moulds, and the result of that will tell more of how the final look will be – not as beautiful and detailed as Emmanuel Nouaillier’s, but hopefully very nice buildings for gaming. 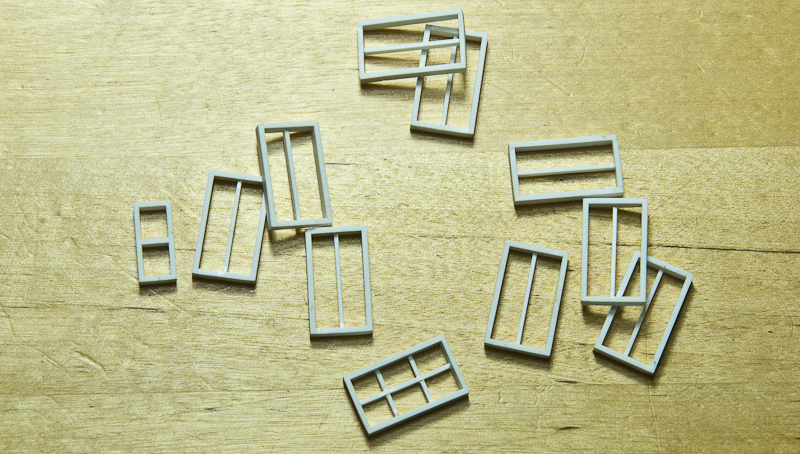 The pieces I make will be assembled to work as base elements in a system where I have made rules for sizes for both length and height of the buildings. In this way I will be able to re-use many of the parts and to make a great variety of buildings with as many floors as I want to add on them in the different games we will play. This system also gives the possibility to make the inside of the buildings if there is a wish to be able to put figures in the houses. 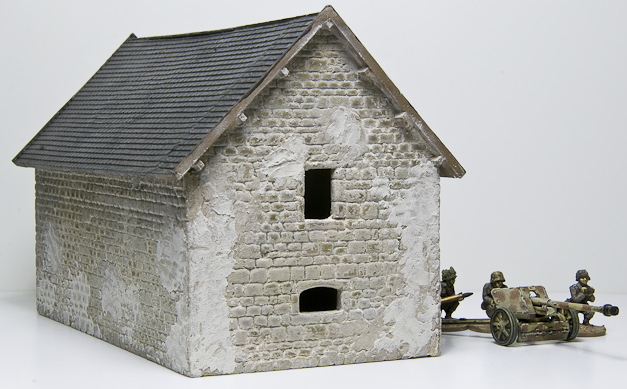 The plan is also to make ruin parts that I can add either if the houses from the start has been damaged or if they during the game takes hits from artillery. 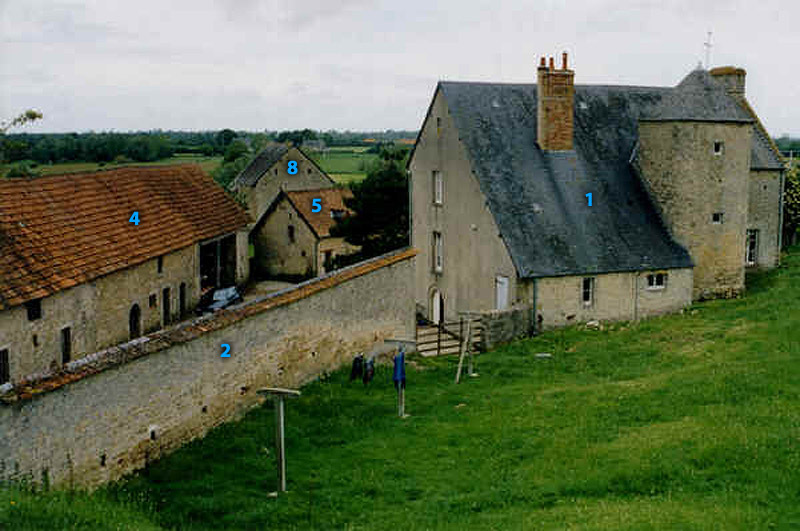 This is the first batch of houses that has a typical Normandy rural design. 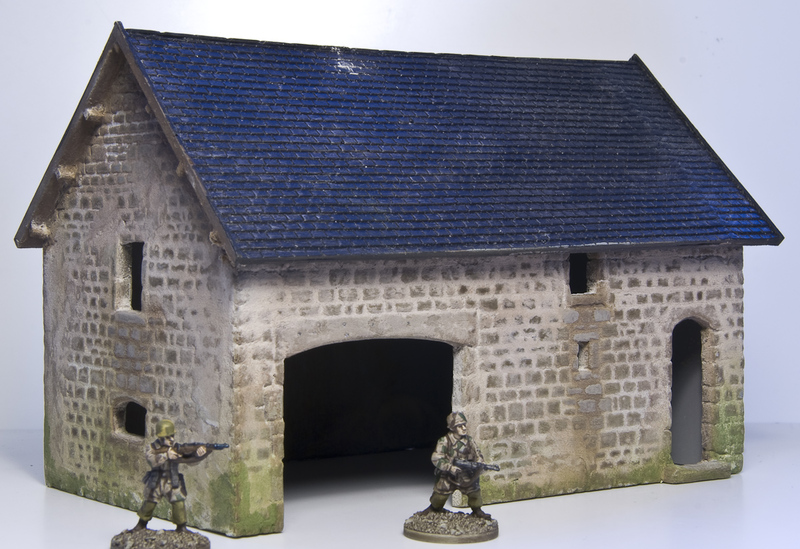 Next I will do town houses in the best Carentan style. * As I remember it from my memory. Last night I finished some more US stuff. Gave the figures a dull coat this morning and this evening added weathering to the 57mm gun using oil paints and pigments. This is all made quite quick – the quality could be better. The gun is Airfix and the level of details are not very high, but I just didn’t have the energy to build the AB Figures gun that I have – too many parts. 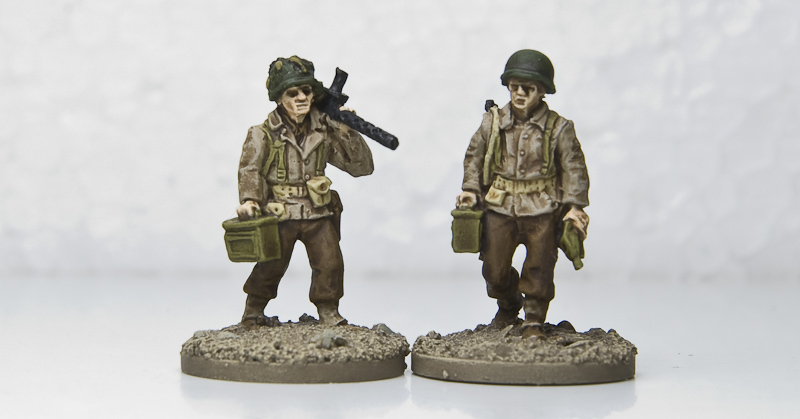 My can of Army Painter Quickshade also seems to be too old, it just don’t do as I want to anymore, there is also started to appear bigger dark flakes of dried varnish which is very annoying when painted on to the figures. 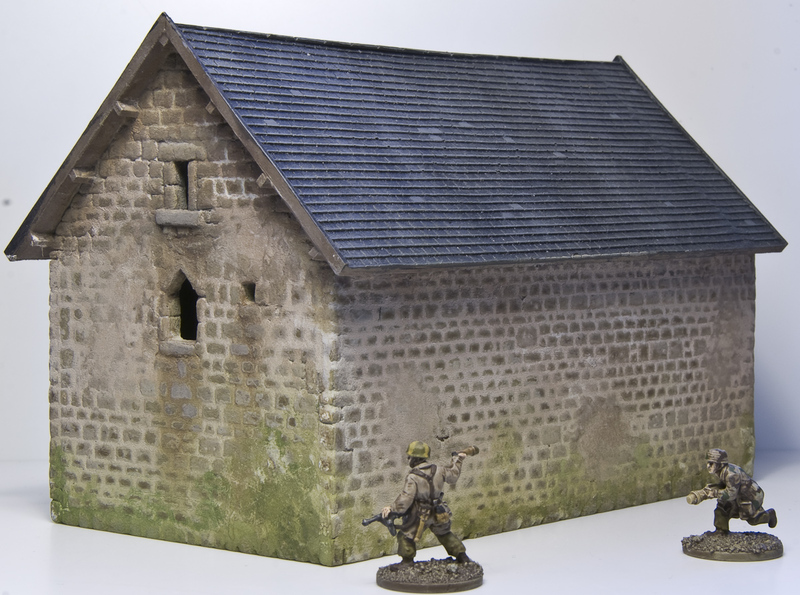 There are lots of things to do before we will be able to play the Battle at La Fière Bridge. The biggest task will be to do the terrain. Most of the figures are painted and the vehicles I have already started on. 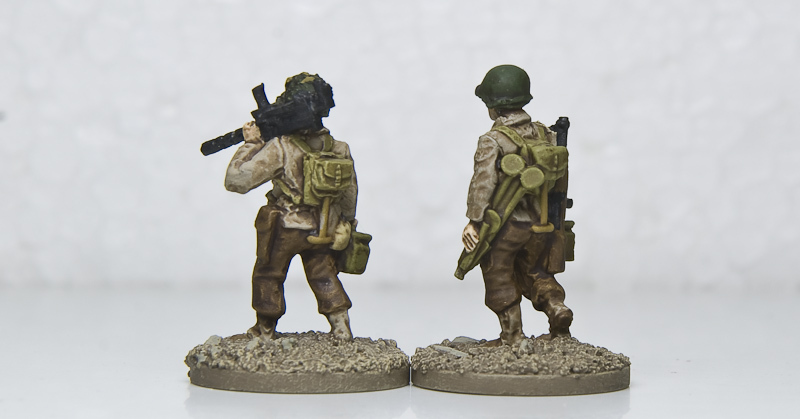 It is stupid that I don’t have all the infantry painted already, but I started to repaint most of my figures some weeks ago. The good thing though is that more or less everything I need is bought already, so no excuses for not getting it done. This is only the 3 Skirmish Campaign scenarios… I think I will add two more from IABSM’s scenarios later, then I will need more stupid french tanks. 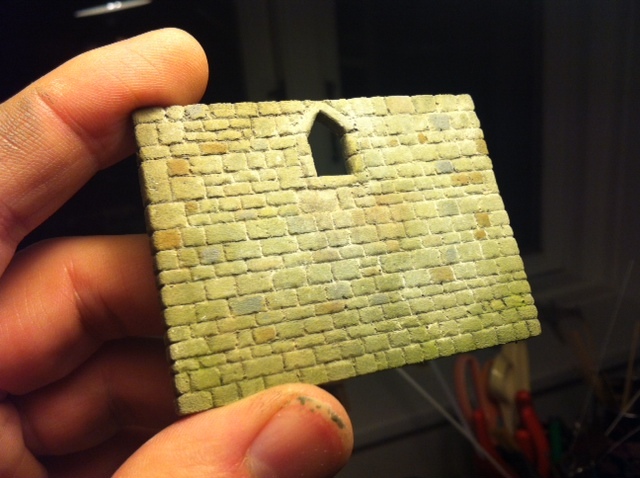 I am still not quite sure how I will do the terrain – if I am going for terrain boards that have everything stuck on it, like the one’s that I started do a couple of years ago (This! ), or do the old usually type where hedges, houses and all stuff are terrain-pieces that can be moved around and be re-used to other games. To be honest my old board idea wasn’t a hit, I should had listen to other gamers. But still the idea about them was good, but the amount of time that I lay in those boards was way to much. There’s some really cool buildings in this scenarios and it would be sad if I only used ordinary “houses”, both the cool old farm built on a hill or the weird-looking Chapel, but also the causeway crossing through the flooded fields – this pieces are so cool that they must get special treatment. So I still don’t know how I will do it. 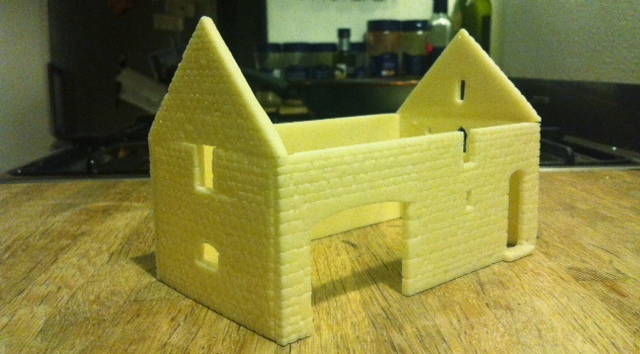 Ok… this is a project that I started long times ago but not really getting up to speed on. By writing this post maybe I can gather my thoughts on all the different tasks that lies ahead of me making this into playable scenarios on great terrain pieces. It all started when I was going through the different scenarios in the Skirmish Campaigns scenario book: “Normandy ’44-First Hours”. Several of the maps was so bad that I tried to find better maps other places. In the process this battle caught my attention. Several things make it interesting, a desperate battle around one single little bridge that was equal important for both sides, one single long causeway going through a flooded field that first Germans tried to cross, then the Americans, hopeless lack of bigger tanks and very interesting terrain triggered my interest. Many days of fighting in the same small area are great when building terrain because the stuff you build can be reused several times. 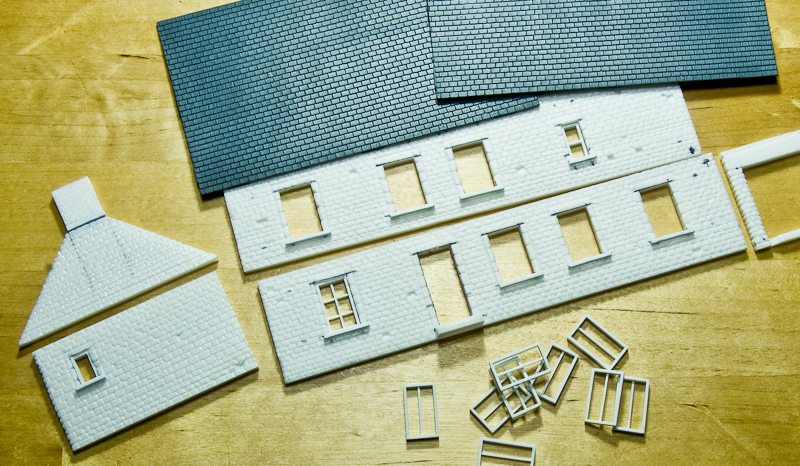 The houses in the area are few, so that I can build every single one of them, and because they are typical Normandy houses, I can use them to make molds so that I will be able to multiply the houses for other Normandy scenarios. Earlier on I had bought some of the tanks that was going to be used in the battle, captured french Renault R35’s, a stupid little tank that was both expensive to buy (I needed 4 of them) and they needed som conversion to work as I wanted them to. I also had to find out how they was painted, if they had camo and what their turret numbers was. One forum in particular was very useful as members was doing a great job by looking through movies and photos to find facts on all this. Find a link to the forum together with the WIP on the tanks here! 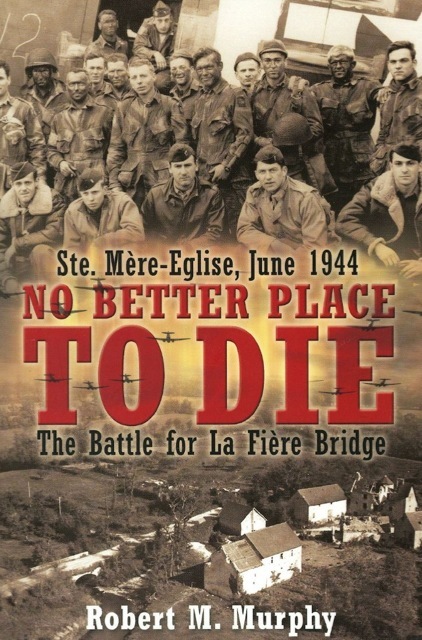 It didn’t take long before I found a book that is covering the battle: No Better Place to Die. It is an absolute must to all like me that want’s to do scenarios of this battle. It is filled with useful information and lots of pictures that isn’t shown elsewhere. Reading this book made me very excited about the project. Another thing that I have been doing is to plan how to do the terrain. Google Maps been very useful as their satellite photos are very detailed in this area. I have been cutting and manipulating the map to make it fit better into a tabletop format. So Right now I’m aiming for 4 pieces of terrain boards that is 60×120 cm, together that is 240×120 – if the terrain really should be downscaled to 1/72 it would probably be much bigger, but I’m not sure a bigger terrain will make the game more fun – but I’m still thinking on maybe make it 360×180 which will force me to play it another place than in my home because of the size. 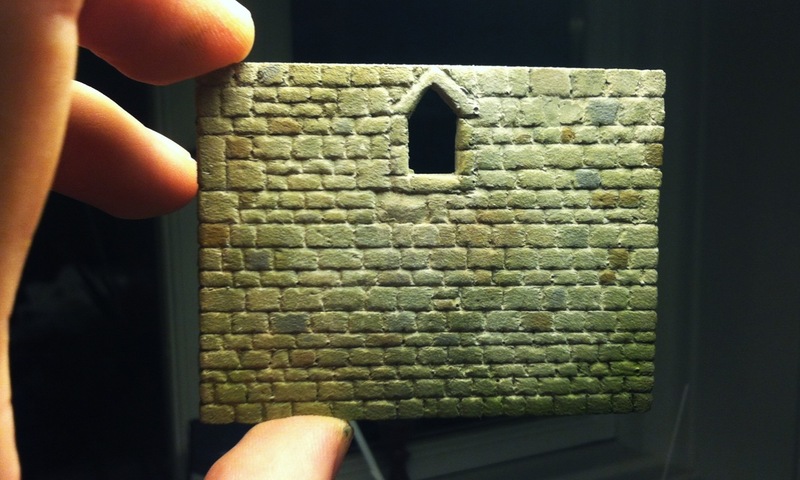 This is how I at the moment want to make my terrain boards. I will skip a big part of the causeway as I’m not sure that it is needed because of the curve in the road. Click the picture to get a bigger one. In the top right the little bridge is visible. This is probably the first view that many of the US soldiers got of the bridge. The big farm to the left was I hide out for some german soldiers that arrived the evening before. The farm itself will make a fun task to build. This view is from a bit further down the road from where the other picture is taken only looking backwards instead. The same spot as where the road bends to the left the Americans put a 57mm AT Gun, this gun alone together with some bazookas was all that they had to stop the german tanks. The hills to the left of the road is what remains of some kind of fortress that dates back to ancient time. This is a better view of the bridge. The fields on both sides of the causeway, from the river all the way to the treeline in the horizon was flooded by the germans which made the road the only way to cross over. The causeway does bend to the right which made the crossing a bit more safe to cross as there is not line of sight all the way down the causeway. An abandoned german truck was placed just in front of the bridge to stop the tanks from crossing. 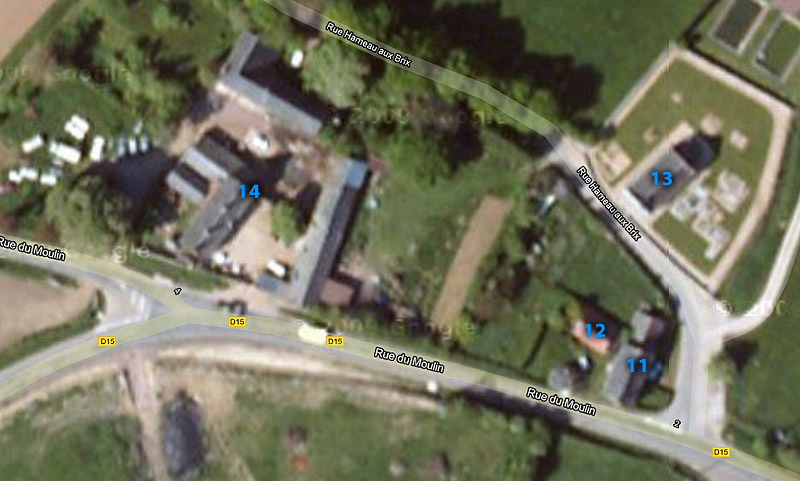 German artillery and mortar fire was hitting this area very hard for several days. The farm seen from the bridge. It is maybe hard to see on this image because of the small size, but with Google’s Street View you get a very good idea of the how the farm is build on several different ground levels, which makes it very cool to build. This I would never know if I had just studied the pictures found in the book. This is the first thing the german tanks saw when they passed the bend in the road. The first tank to reach this place was taken out by two bazooka teams hiding on both sides of the bride, the second tank was hit by the 57mm AT Gun. German soldiers dug in on both sides of the causeway. In the end of the causeway on the german side of the flooded fields, looking left you see this hedgerows, so typical for the area. Looking to the right you’ll see a house heavily defended by the germans later on when the americans try to cross the causeway. Further to the right the Chapel is seen. This too was a place where heavy fighting took place. This image is pure gold when I am going to build the houses. Further down the road this houses lies. Right now I try to decide if I will use the scenarios from Skirmish Campaigns or them from IABSM. The difference is that Skirmish Campaigns scenarios are downgraded so that what was a company in real life are platoons in this scenarios. Skirmish Campaigns also use what they call “Variable Attachments” which is a roll you make to see what extra units you get, this can be units that are known to be in the area but not necessary in the battle, extra artillery or can be civilians that assist as if they where scouts. This make the scenarios more fun to replay. IABSM’s scenarios are more detailed and the amount of troops you get is closer to what it actually was in real life – but I’m not sure that it is fun to play with three companies per side. I will probably do something in-between. Stay tuned as I will start to post my work in progress in a couple of weeks.